Hawai'i's lure as a beach paradise is undeniable, yet it's the authenticity and wisdom of native Hawaiian culture and spirituality that deeply touches all. 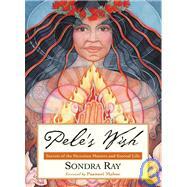 In Pele's Wish, author Sondra Ray explores kahuna teachings with guide Puanani Mahoe as they adventure through volcanoes, sacred Hawaiian rituals, and more. Learn how to: Experience greater harmony through understanding your three spiritual selves - 'unihipili, 'uhane, and 'aumakua, Resolve conflicts and create more loving relationships with the ancient counseling and prayer technique ho'oponopono, Manifest your dreams the kahuna way. Book jacket.